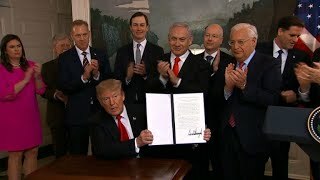 President Donald Trump signs a proclamation recognizing Israeli sovereignty over the disputed Golan Heights. The Trump administration's illegal and unilateral recognition of Israeli annexation of the Syrian is an unfortunate return to the international jungle of the 1930s and 1940s, when Hitler annexed the Sudetenland and Mussolini annexed Nice from France. Trump's policy is Nazi law, as so many of his policies are. His first wife Ivana maintained that Trump kept a copy of Hitler's speeches on his bed stand. It was said as part of a nasty divorce. But it is, sadly, nevertheless plausible. The United Nations charter was crafted after World War II in an attempt to create a more just world order. One of the things the UN sought to do was to make aggressive warfare illegal, and to make annexation of other countries' territory equally illegal. Israel and the United States are both signatories of the UN Charter. Their problem is that the US wants Israel to be able to act with impunity in the Middle East, since it is a sort of aircraft carrier for US hegemony in the oil-rich region. The US might -- tsk tsk -- when Israel occupies 10% of Lebanon, as it did in 1982-2000, but Washington never does anything practical to rein in Israeli expansionism. Only when the other side has a powerful military (Egypt) or an effective guerrilla resistance (Hizbullah in Lebanon) do the Israelis relinquish any territory they have gobbled up. The argument being trotted out with regard to the Golan is that Israel conquered it as part of a defensive war, and annexing neighbors' territory is all right if it is done after an aggressive war. They point to adjustments against Germany after World War II. This is a bad faith argument, since the UN Charter was thereafter established to handle these issues and it invests the UN Security Council with the authority to make these decisions, not individual member states. People need to be more aware of the "Might is right doctrine." This doctrine was broadly applied in Europe in the 30's and 40s' and is being applied again now and ultimately will have the same result. The game's the same, only the antagonists have changed.